Can Eating White Rice Help You Lose Weight? White rice lacks one of the elements known to support weight loss: fiber. It's a rich source of carbohydrates, which are essential for sustaining energy as you cut calories, but the carbs in white rice can cause a surge in blood sugar that undermines weight loss. On the plus side, white rice is filling, and if you watch how much you eat, it may be a comfort food that helps you stick with your diet. White rice isn't the healthiest choice, but any food can help you lose weight as long as you limit the total amount of calories consumed each day and exercise enough to burn more calories than you take in. One-half cup of cooked white rice has 103 calories, which is low enough to fit into any weight-loss plan. But if you don't pay attention to portions, it's just high enough in calories that you could easily consume more than you realize if your serving size is much larger than half a cup. You'll get 22 grams of carbohydrates from 1/2 cup of cooked white rice, which is 17 percent of an entire day's carbs based on the daily recommended intake of 130 grams. 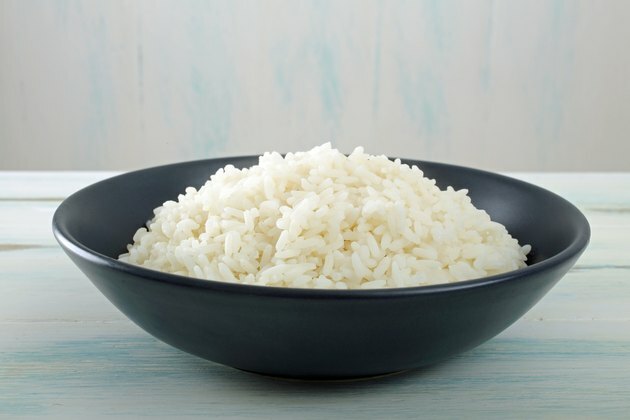 The concern about white rice is that the carbs are not offset by fiber, the presence of which would slow down carbohydrate digestion and help regulate blood sugar. In contrast, the carbs in white rice cause a spike in blood sugar. As insulin works to return blood sugar to a normal level, it promotes the conversion of sugar into fat, while also making sure that fat is not used for energy. These actions promote weight gain rather than weight loss. Nutrient density is defined as the amount of nutrients you gain for each calorie consumed, according to an article published in 2010 in "The American Journal of Clinical Nutrition." It's especially important to choose nutrient-dense foods as you cut down on calories to be sure you get all the vitamins and minerals your body needs. White rice falls short on nutrients when you start limiting portions. A 1-cup serving is a good source of selenium, iron, folate, niacin and thiamine. But cutting the portion in half to limit calories also significantly diminishes the nutritional value of the rice to the point where it's only a good source of folate and thiamine. You're more likely to lose weight and keep it off by dropping weight at the rate of 1 to 2 pounds a week, and by creating an eating plan you can stick with for the long haul, according to the Centers for Disease Control and Prevention. Whole grains, such as brown rice, are better for weight loss because they contain more fiber, and the U.S. Department of Agriculture recommends that at least half of your daily grains should come from whole grains. Still, this allows room for occasionally enjoying white rice. By pairing white rice with vegetables and lean protein such as chicken, you can also boost nutrient intake, lower the impact on blood sugar and better support weight loss. Centers for Disease Control and Prevention: Healthy Weight - It’s Not a Diet, It’s a Lifestyle! USDA ChooseMyPlate.com: What Foods Are in the Grains Group?